It is November 1st! I have waited 11 long months for Epilepsy Awareness Month to arrive again! Last year was a new adventure for us and I was just getting my feet. It was only the beginning of letting people into my world. My family supported my efforts for 30 days by wearing purple, wearing and sharing purple ribbons, holding purple days their schools and encouraging me to be proud to be me; epilepsy, brain injury and all. As I sit here now in my purple shirt, purple shoes, purple earrings, purple bracelets and purple ribbon, there is still a part of me that wants to gulp when people ask why I’m wearing a purple ribbon. Will it ever be easy to say “I have epilepsy”? Will I ever stop fearing the response or the stares? Will I ever stop that twinge of madness I feel when the alarm on my phone rings and I know it’s time to swallow more pills that will upset my stomach, confuse my mind, slow my speech and make my hair fall out? Will I ever stop fearing that SUDEP will take me during the night? If I’m completely honest, probably not. But living in fear is not living. So I’ll choose to live in awareness and share what I know and what I have learned, because I can’t let fear win. Six months ago I decided to celebrate Epilepsy Awareness Month by joining the Epilepsy Therapy Project and running the Philadelphia Half Marathon on November 18, 2012. I knew I could run 13.1 miles. I assumed I could convince my Mom to go with me and make a complete nuisance of herself by decking out head to toe in purple and yelling my name all over Philly and pretending to be Rocky on the steps of the famed Art Museum. I even thought I could convince a friend or two to go and run with me. I truly had NO idea my friends would jump on board like they have! Seven other runners teamed up with me and have helped raise a lot of money for the Epilepsy Therapy Project. A lot of generous people and businesses have supported our cause and dug deep in their pockets. The outpouring of financial and emotional support has warmed my heart and given me great hope for the future of treatment for epilepsy. It’s November, and it’s Epilepsy Awareness Month! I am excited about a month of fun adventures, including seeing Charlotte uptown light up purple on November 15 when Wells Fargo’s Duke Energy building turns purple for team Shaken, Not Stirred! 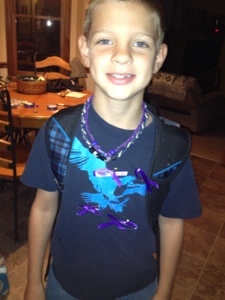 We are all wearing our purple ribbons and we have more to share! This entry was posted in Advocacy, Brain Injury, Epilepsy Awareness, Running and tagged Epilepsy Awareness Month, Epilepsy Therapy Project, Philadelphia Half Marathon.